CraneWerks is a Master Crane Builder for R&M and a leading crane builder that designs, engineers, fabricates and installs bridge cranes all over the country. We build CMAA class ‘A’ cranes up to Class ‘F’. 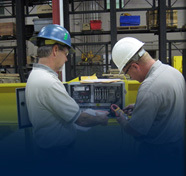 We guarantee the highest quality control and maximum reliability when our cranes are working hard for you. CraneWerks offers everything from complete turnkey solutions for your overhead crane needs to providing simple crane kits. As a Master Distributor, and crane builder for R&M Material Handling components, we are ready to handle all of your crane and hoist needs. CraneWerks provides fast and accurate proposals with great prices, quick ship options for standard capacity crane systems, and professional installation. QX® Modular Crane Packages are pre-engineered, complete crane component packages utilizing cuƫng edge technology. Variable frequency drives are standard on trolley and bridge moƟons for smooth starts and stops. Plug‐in cabling* and bolted structural connecƟons simplify assembly. QX® Modular Crane Packages are equipped with your choice of C‐track festoon system or the new NRGmaster electrification system. Plug‐in connections not available for all packages. You’ll receive all the components including: Hoist, End Trucks, Control Panel, Pendant Station and Festoon Electrification. You provide the bridge beam, labor to assemble and paint. We will let you know what bridge beam to use. We provide an easy to use manual that will guide you step by step through the process. And, we are just a phone call away if you need some help. We also can supply you with runway engineering, drawings and installation if needed.